Two and a half years after the first Christchurch earthquake in September 2010, there has finally been some progress. With time running out on the red-zoned condemned land, a new house was purchased at auction. A packed room, full of expectancy, uncertainty, back stage negotiations, then SOLD! to a round of applause. Ten days later there was more drama when a ‘big cheese’ from the insurance company flew in from HQ following our intent to commence legal proceedings to recover adequate re-building costs for the earthquake damaged house. Hastily arranged meeting with ‘BC’ and our lawyers- more negotiation, then suddenly the deed was done. Nobody’s expectations were fully met but everyone walked away reasonably satisfied – and happy it was all over at last. Betty’s son Ariki, daughter Ceri, and four granddaughters Anikah (8), Talia (6). Bella (4) and Jemima (1) came for a last visit to Grangi’s house on the edge of the sea; the children gleefully painted and crayoned on the lounge walls. 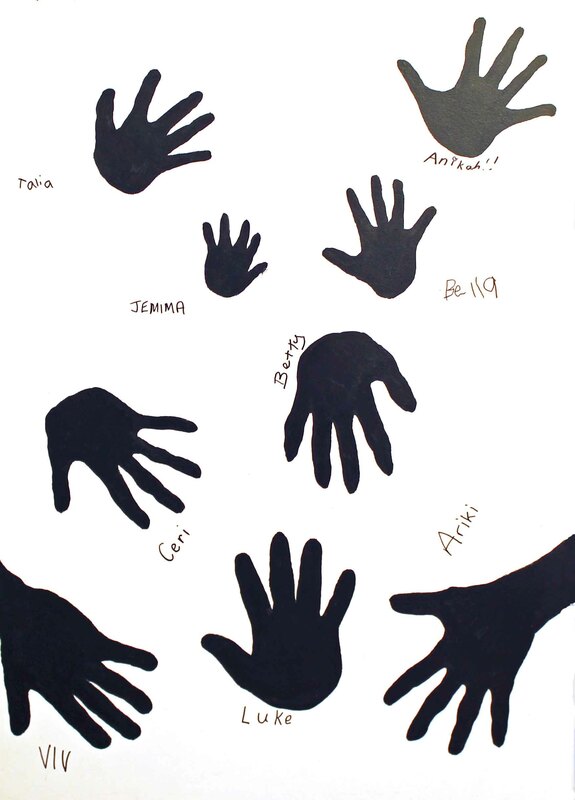 We all left our handprints too- evidence of the life of a family. Two days later we locked the door of a much loved house- now empty, sad, broken, desolate, abandoned. The next visitor will arrive in a bulldozer. This entry was posted in Welsh Gaffer's Log by Viv Head. Bookmark the permalink. Slightly disappointed after all the effort I went to to scan and send an outline of my hand and then not to make the final cut to your website!!! Was it because Anikah was so quick to point out that mine was the biggest!!! Ahhh, used the wrong photo! Now fixed. Go to hand it to you for noticing- must be the keen eye from all that hunting. A sad tale Viv, well told. One question – if you were leaving for ever and if the next visitor would be a bulldozer, why bother to lock the door? !